Good afternoon to you all! Hope you've had a productive day. Yesterday I was making myself a cup of fruit tea and was contemplating what snack to have with it whilst looking at my empty cupboards. While the kettle was boiling I ran down to check my mail and to my surprise (as I thought it wasn't coming until the end of February) I found this! I had signed up for the Nutribox after I had read about it on someone else's blog. It is basically just a box filled with 9-11 healthy snacks, most of which are suitable for vegetarians as well as being gluten and dairy free, that is sent straight to your doorstep for £12.95 a month! This is so handy if, like me, you only have one shelf of 'healthy food' and snacks in your local supermarket which are overpriced and often hard to find! Apple Crumble, The Energiser and Brazil Nut Mix nut mixes (surprisingly enough! ), Cocoa Orange Nakd bar, Beond Berry bar, Rude Health Pumpkin bar, Pulsin Raw Chocolate Brownie, Bounce Spirulina & Ginseng ball thing, Miss Wallflower Candy: Energise and Ombar Probiotic Coconut Chocolate. I'm going to list all of these products below and give you all my opinion as and when I try them in case you are interested in trying them yourself! So keep checking back at this blog post for the updates as I've only tried three so far! I think these are pretty self explanatory; dried fruit and nuts in a bag! You can't really go wrong with that! After looking at their website I think I will definitely be trying more products from this company. Size/ Amount: These are quite small bags but I suppose that's good as they are all so moreish! Price: 65g bags of these retail at £1.50 from what I can see. You Can Buy Them From: localised health stores and some co-ops as well as online. The second contains hazelnuts, walnuts, dried apple and chopped dates. The third contains brazil nuts, almonds, sunflower seeds, flame raisins and cranberries. How wrong was I?! I totally and utterly LOVE these bars. The taste is so surprisingly chocolatey, the texture is great and they smell great too! I think I may like them better than the 'oaty' nakd bars! Size/ Amount: 10/10 - Same as the rest of the bars; perfect size for a filling snack. Price: 60p (in waitrose and tesco just now!) per 35g bar; Cheaper than the rest of the bars; probably due to the fact they are more well known. You Can Buy Them From: Most Supermarkets, health stores and online. Well what can I say; I love, love, love this bar! It's great! Not too soft, not too hard, not too sweet and not too bitter. It's a perfect combination of flavours and has a great texture with little crunchy bits! As with the Rude Health Bar below, I will definitely be buying this again and look forward to trying other things from Pulsin'. Size/ Amount: 10/10 - Just the right size; filling but not too sickening. Price: approx. £1.25 per 40g bar (I suppose this is quite expensive but I think it's worth it!). You Can Buy Them From: online health and nutritional stores and the Pulsin' website. I was pleasantly surprised by this bar; it manages to be sweet and spicy at the same time and is delicious considering it contains only a few (all natural) ingredients. It is a similar taste and texture to a nakd bar (perhaps a bit harder) but the spices add a new twist. 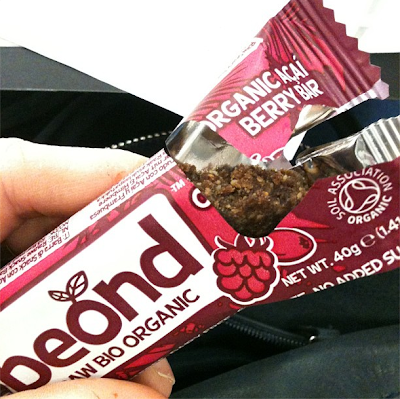 I will definitely buy this again and after looking at their website, I'm tempted to try the beetroot bar too! Size/ Amount: 10/10 - perfect size for a filling snack between meals. Price: £0.96 per 35g bar (which I suppose is quite expensive!). I am majorly excited to try out the rest of the Pulsin' and Beond range because I love this brownie as much as the Acai Berry Bar! This company is amazing! To make a healthy chocolate brownie that tastes better than a regular one?! I wish I had the recipe to this brownie so that I could have it every day! Size/ Amount: 8/10 - I split this over two days as it is quite large and an indulgence. Price: approx. £1.50 per 50g bar (You would pay more than this for a brownie from a coffee shop!). I must admit, when I first tried this bounce 'ball', I wasn't too keen as the tastes were quite peculiar so I put it back into my nutribox and left it there. That was until I came in from university today, absolutely exhausted after practically running home uphill with my heavy bag and laptop. 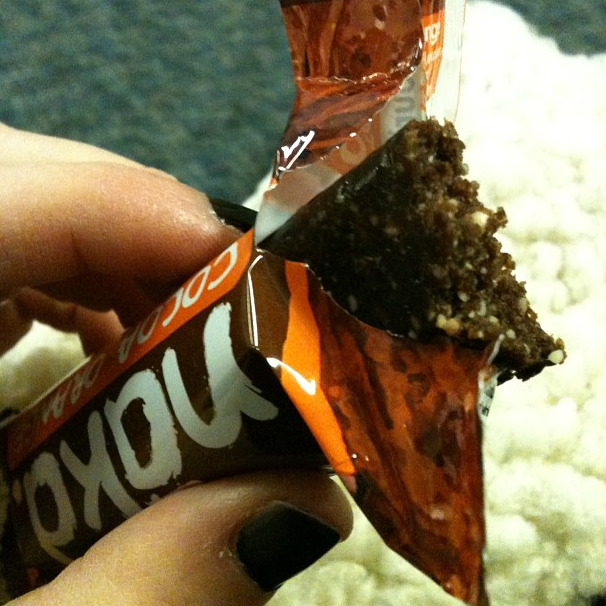 I reached inside my cupboard and pulled out this bar and it really did give me a 'boost'. The taste was so much better than when I first tried it and I was pleasantly full until dinner time. The texture is also really nice; a cake-y consistency with a nutty exterior! The other flavours look great too! Size/ Amount: 8/10 - Again, as mentioned, I split this over two days. You Can Buy Them From: Waitrose, online health and nutritional stores and the Bounce website. An exotic combination of energising superfoods and herbs. I am sorry to do this as this product is made in Scotland and I'm all about promoting things from my country but I do not like these raw cookies at all. I know why though! Coconut. I HATE coconut. It is one of the foods that I absolutely despise...even the thought of it makes me feel sick. Anyway, rant over! These products are a really great idea and I would definitely love to try one without coconut in them (I believe the only one is the Nourish Variety). I'm sure if you like coconut you will love them. *UPDATE: I have been informed by Sarah from the Wallflower Candy Company that there are currently no products which contain coconut as it is a main ingredient but they will be bringing out two non-coconut products in April! I'll be trying these as soon as they come out so I'll let you know what I think! I'm sure I'll love them. I think you can guess how this is going to go from the main ingredient...It looks like chocolate, it smells like chocolate and to be honest, it tastes like chocolate with a lingering coconut taste. I took a little nibble out of this and was really disappointed that the coconut was so strong as I think apart from that I would have loved it. This probiotic chocolate is made from completely raw ingredients and coconut cream. I am dying to try some of the other varieties mentioned on their website (Strawberry sounds great)! So that's what I think of what I have received! I got a really good mixture and it was great to try all of these new products. I have already cancelled my nutribox subscription as, apart from my student budget, is hard to keep up with any subscriptions as I am away for half of the year. I would, however, definitely recommend this company because, as I mentioned before, it is a great way to find new healthy foods that you can't necessarily buy nearby. It also seems a friendly company; I received a lovely personalised email from them after explaining why I wanted to cancel my subscription! Have you ever had a nutribox? Or tried any of the products mentioned above? Which do you think you would like? Have you got any favourite similar healthy snack products (this question especially refers to people in other countries)! By the way, I've mentioned this in my newest post but I'll add it in here too... I've finally made a twitter associated just with this blog so I would love if you could follow me! As well as links to the blog, I will also be tweeting daily health and nutrition tips, recipe ideas and photos of things that I am eating or making! If you follow me, I'll follow back! Good feedback on these products. I'll definitely be trying some of these! I'm fairly picky when it comes to pre packaged goods so I am constantly looking to see what kind of preservatives they've put in their products...If any at all. All of these things look great! And if they are made with natural ingredients with little or no preservatives I'd say you have yourself a great find! I am also very picky when it comes to packaged snacks! They all have so many artificial ingredients and flavours in them! That's why these ones are so great! Pankaj International manufactures and supplies wide variety of best quality pole line hardware, high tensile fasteners, fence fittings like 2h nuts, b7 studs, hex nuts, hex bolts and many other line construction hardware products. Our company Uk Airport Services and all our drivers are officially licensed by the Public Carriage Office and insured to carry the public safe and comfortably.Our aim is to offer the best reliable and safest transport service to all our customers at a competitive price.